This is a good meal for handy fathers because it is a meal that the kids will eat, and it is simple and nutritious. 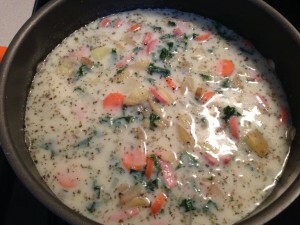 This sausage & potato soup is a favorite of my kids. I made up the recipe, and have evolved it to this point with few changes. No recipe per say, but I did loosely pattern it after a sausage and potato soup from Olive Garden. It is different each time. Two carrots sliced go into the pot first. I cut up 7 potatoes. I’ve experimented with types of potatoes, and love the red potatoes or klondike gold, unpeeled. I always cut the potato in half length-wise, and then into thirds, before slicing about 1/4″ pieces. The small pieces make for faster cooking time. Put them in the pot then add enough water to cover them and bring to a boil. I dice an onion, saute it and add it to the potatoes. Then I dice some kale and add it (about six leaves without the stalks). And Italian seasoning, parsley, basil, salt and pepper to taste based on how much potato and water I used. By this point I add enough milk to cover everything and simmer until it is soft. This is easily enough to feed a family of 5, which is our family size.